The inaugural Ecotourism and Sustainable Tourism Conference (ESTC), organized by The International Ecotourism Society (TIES), is being hosted by the University of South Florida Patel College of Global Sustainability in Tampa. TIES is an internationally recognized nonprofit organization that seeks solutions for more environmentally sustainable tourism options, including ecotourism. 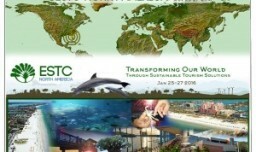 The ESTC conference is gathering many notable tourism industry experts from the United States and around the world, including representatives from TIES, National Geographic Explorer, United Nations World Tourism Organization, the Walt Disney Companyand many others, discussing and conceiving new sustainable tourism opportunities.